Donald Young School was the only elementary school in town. The kids you began kindergarten with were your classmates for the next nine years. I only vaguely remember looking for a spot on the floor to lay down with my blanket during nap time. We hatched baby chicks in our classroom. Eggs sat resting beneath heat lamps. Violet used to sing in the bathroom. SRAs. Do you remember these?! I won the Spelling Bee. It was the first and only trophy I’ve ever won. True story. Nathan Ludwig ate hot dogs that came from his thermos. We were all so grossed out by it. My mom used to send wagon wheels in my lunch kit. I used to squish them in the white plastic package. Spelling tests were a big thing. I remember Grandma Lainie helping me practice during visits at Flanders. She taught me how to spell the word to-get-her (together). Her little trick – look for little words in the big word. I got a love letter from a boy in class. Check off the answer to: I love you. Do you love me? Yes or no. He followed me around for most of the day. I remember sitting on the stage in the gym and him switching spots with others to slowly make his way closer to me. I couldn’t take it anymore. I turned the note into the teacher by the end of the day. Romance? over. I remember self-publishing our own books. We had a guest come in to show us how to create a book cover from two pieces of cardboard. We were able to choose a fancy piece of wallpaper to carefully fold around the front cover and the back of our books. She taught us how to write a dedication page and how to leave a blank piece of paper at the beginning before starting your story. I wrote a book called, Little Miss Snobby (inspired by the Little Miss and Mr. books that were so popular at the time). My Little Miss Snobby wore glass high heels, lived in a mansion, and wore diamond earrings that dangled from her ears. I remember practicing our spelling words in jello powder on white styrofoam trays. We could lick our fingers and eat the crunchy sugar crystals. I remember the Veggie-tona 500. Yes, you read that correctly. It was a project of sorts where we were able to choose a vegetable to make into a car. We had to think about what vegetable would be ideal in relation to aerodynamics, weight, speed, etc. I think I chose to put wheels on a cucumber. We took turns racing our veggies down a ramp. I won second or third place. Science fairs were a big deal. Time was spent at the local library, signing out books filled with possible science experiments. Research didn’t happen online, instead we relied on World Book Encyclopedias. A new girl moved into town and into our class. Social dynamics shifted big time. Grade 5 marked the beginning of annual school trips to Biwabik, Minnesota to go downhill skiing at Giants Ridge. I did a project on panda bears. I presented it inside a green duo-tang. I have a dear old grandpa. His hair is turning grey. He has a pair of whiskers. They’re always in the way. and dreams of shredded wheat. Mrs. Meyers went on maternity leave during the school year. I don’t remember our substitute teacher’s name. We had to complete regular book reports. There was a chart up on the closet door near our teacher’s desk. It was a class list. We would receive a gold star sticker when we completed a book report (I think that’s what it was for.) You could quickly see who had a few scattered gold stars on the board. Island of the Blue Dolphins was our first novel study. My Grandma Beatrice passed away. I remember the clock falling off the wall on April Fool’s Day and our teacher losing it. Someone had taken it down to change the time but didn’t hang it back up properly. Garbage clean up was something we actually looked forward to. Being in an older grade, it meant that we got to go for a walk down the River Road. It was an excuse to get out of school, walk with your friends, pick up some garbage, and then enjoy a BBQ and ice cream afterwards. I got my period for the first time and I had no idea what was happening to me. Ms. MacPherson (a new teacher who did not live in our small town). 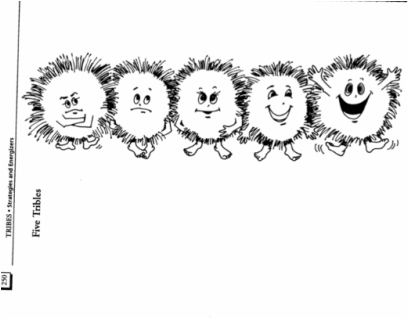 I remember being given a strip of paper with Tribbles on them – some fuzzy clip art drawn character to demonstrate three different feelings. We were asked to show how we were feeling that day by displaying a Tribble. We did a novel study of Dicey’s Song by Cynthia Voigt. Four abandoned kids move in and live with their grandmother. The Grade 8 trip to Winnipeg was the event of the year. Shopping, swimming in the pool at the hotel, IMAX movies, a drama workshop, and Red Lobster. I remember wanting to go to the high school dance (all of the grade 8 feeder schools were invited to a dance at the high school, as a way to meet one another before grade 9). I wasn’t allowed to go. I went up to the cabin with my parents. Madame Low taught French from her cart that was on wheels. She was petite, with short, dark curly hair. You didn’t want to mess with her. She had a great sense of humour and didn’t put up with much in terms of misbehaviour. I loved how she would whisk into our room, speaking French and asking how we were in a sing song kind of way. Comment sa va? Do you remember Tele Francais?! And the dancing pineapple! We had these French readers and Madame would give us one of the character’s lines to read. I was once the parrot. Un, deux, trois, une banane pour moi. Yum. Yum. Random things to remember, yes. And yet, fun to think about.